I have to admit…I am SUPER excited to have Shara from Chasing a Dream guest posting for me today! 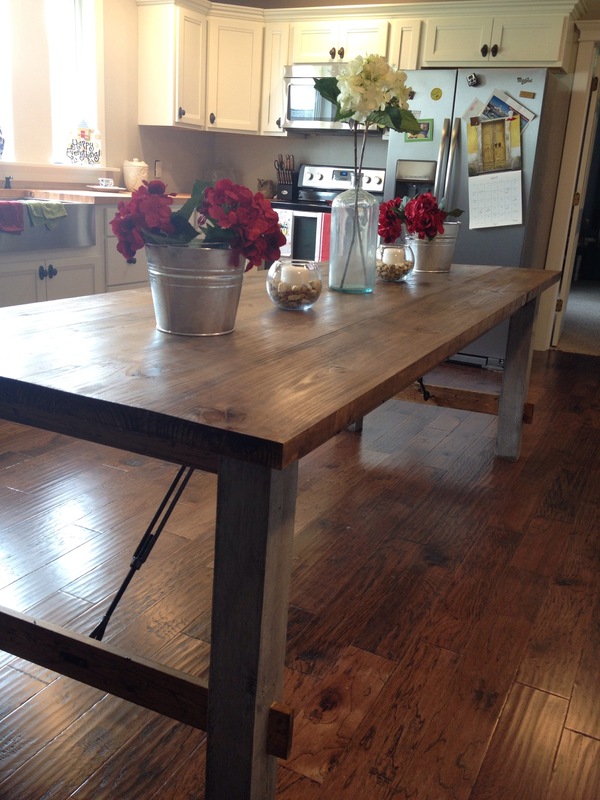 Shara is a DIY-er who loves to (and will try to) build anything she possibly can from scratch. 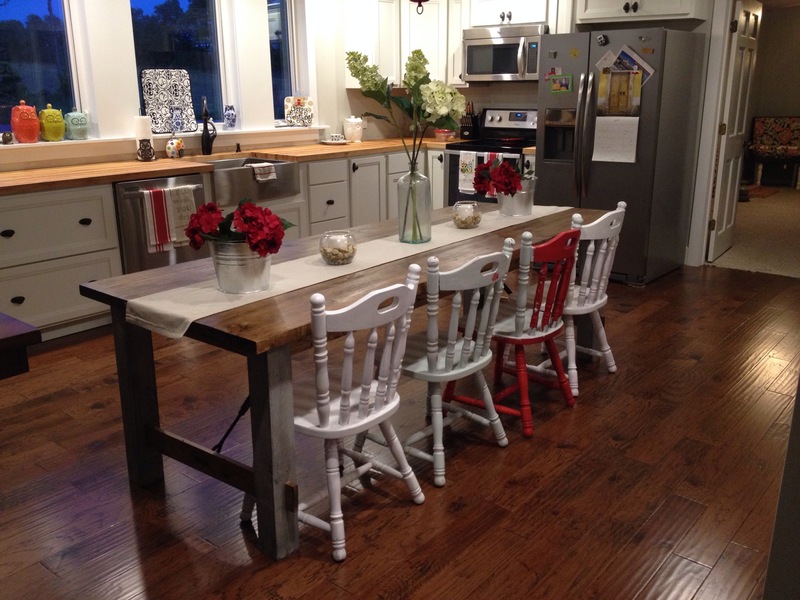 Her blog details the good, the bad, and the ugly of the projects she tackles from home improvement, to building her own furniture, to reupholstering worn out old chairs, to making her own roller shades. She isn’t afraid to tackle a new project even if she has no experience with doing anything like it before. She is currently working on remaking her wood shop, and building some outdoor furniture for her deck while she plans future updates to almost every room in her “new to her” home. Be sure to check out her blog and show her some love! She has lots of amazing projects that will truly knock your socks off. 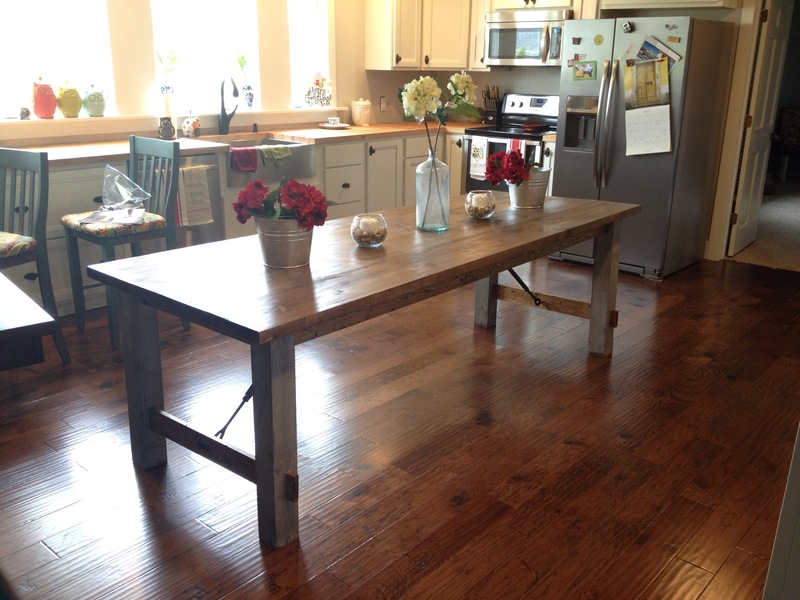 Now, onto her amazing farmhouse kitchen table! Obviously, I loved it! It fills up just enough space in my kitchen to not be crowded, but not be empty–which was the goal here. 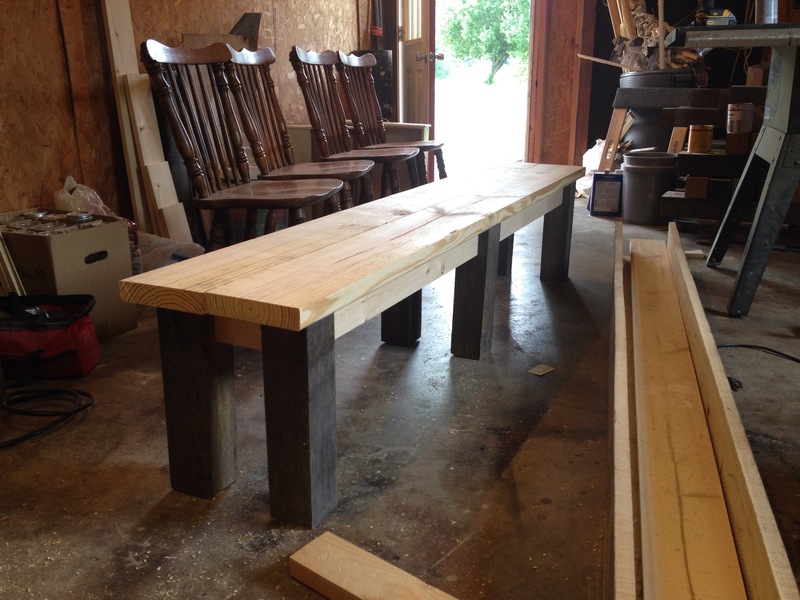 Plus, I can slide the bench under the table and out of the way. Awesome!!!!! It cost me maybe $150 total for the lumber and hardware. Seriously, an 8ft table with seating for 8 for $150. Talk about a steal! I have a pallet full of old 4x4s I got from work several months ago and I cleaned a couple off, whitewashed them and used them for legs. (Much cheaper than turned wood legs at Lowes.) 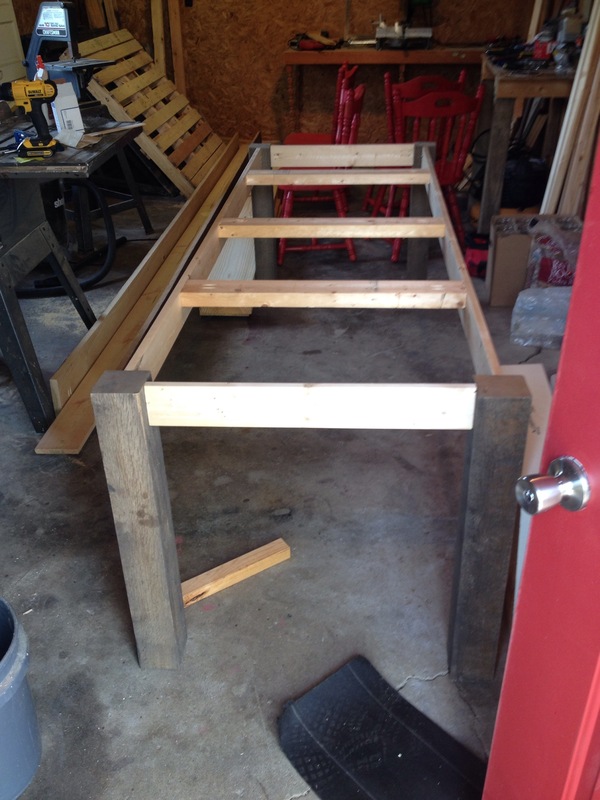 I built the frame one Saturday morning and waited patiently until the next weekend to buy the tabletop wood. Since I’m too cheap to buy pipe clamps (which is like woodworking number one basic tool), I waited for dad to bring his over to borrow. So about a week later, we FINALLY (everything feels like an eternity when you want to finish a project and you can’t yet) got the table top glued and screwed together and I could stain it. I love staining. I love the smell, the process, the colors. I dream about staining all the time…no joke…is that weird? Anyway, I saw a table online that had used turnbuckles purely for decorative hardware on the underside of the table. I thought it was the coolest thing! But, as cool as that might be, NO ONE carried massive turnbuckles. I went to five different hardware stores and looked all over the internet. I finally found some (for a pretty hefty price) at Falders and was so relieved, I paid $50 without thinking. Looking back, I probably wouldn’t have spent that much seeing as you don’t really see much of it under the table…but whatever it’s there whether you notice it or not. See??? I found these chairs at my favorite local junk store for $8 each!! Deal! I clearly haven’t finished painting them here yet. Actually I STILL haven’t finished them and they’ve been in my kitchen for over a month 🙂 that’s how I roll. Priorities, right? After thinking about it for weeks, I finally made this cute little bench. I’m so excited about my new table. I’ve never had anything that had more than four seats and now I’m glad I can have my family over and we can all fit at the same table. 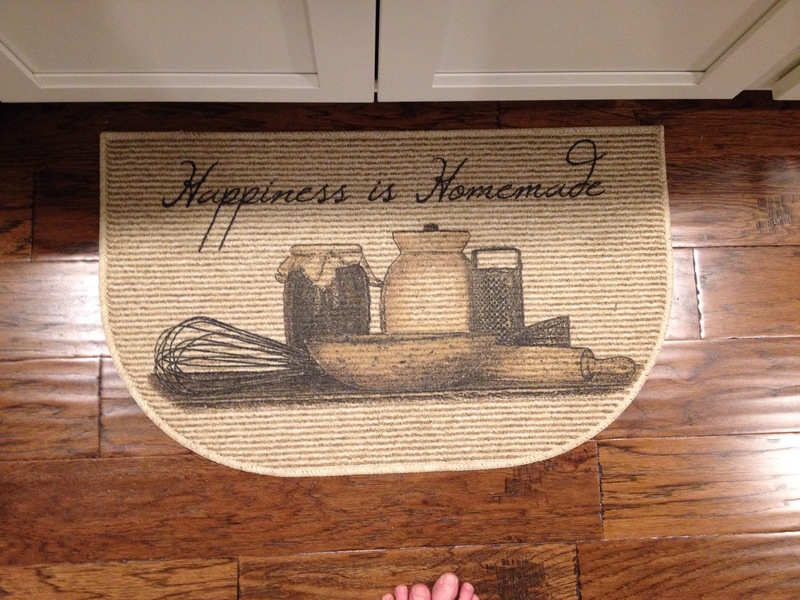 And to top it off, I like that I can say, “why yes, yes I did build that myself (with a little help from dad).” Nothing beats homemade 🙂 My kitchen rug even says so! Ooh, I want one! 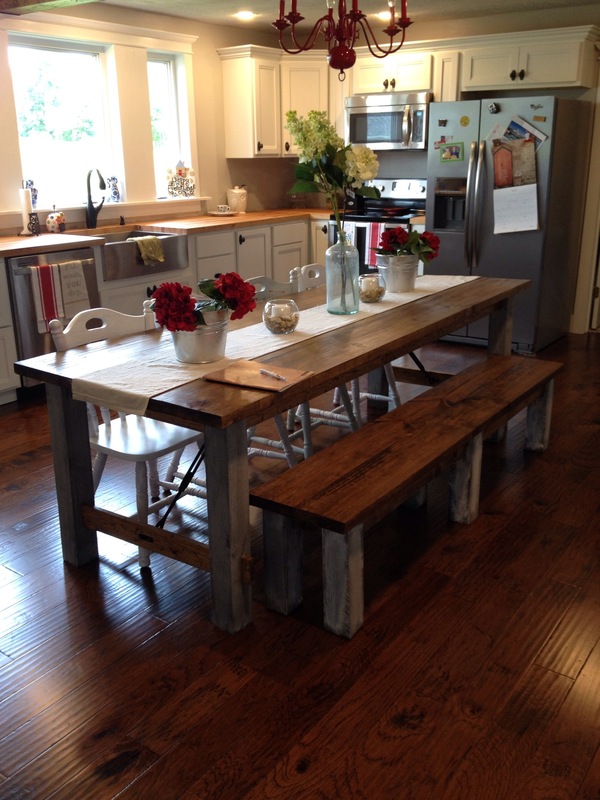 These are beautiful, and I love the look of the table and bench outside. And I love how cost effective they are. Thanks for the tutorial; I’m pinning it!